A bit more on the tugboat scene. Boy oh boy, it’s like the old days at Newtown Pentacle lately, huh? 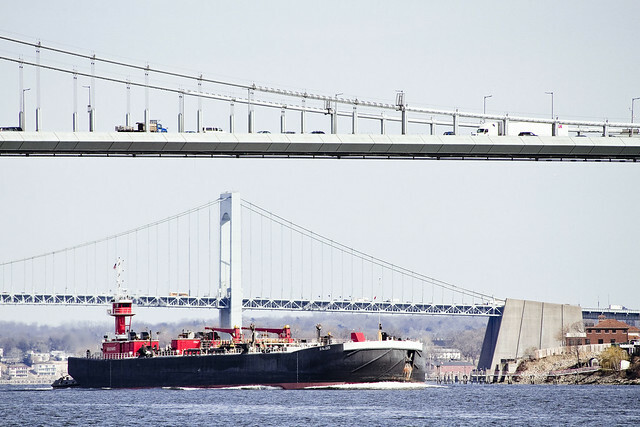 Tugboats, tugboats, tugboats… That’s a Bouchard articulated tug and barge combo motoring along under the Bronx Whitestone Bridge. This tug is heading out of the Westchester Creek inlet section of the East River and heading towards Manhattan. 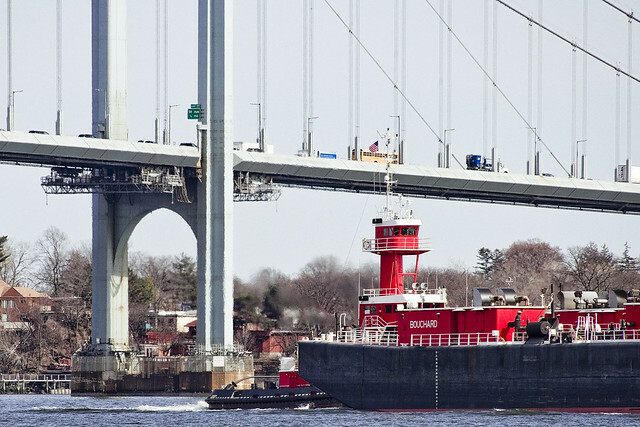 That’s the Throgs Neck Bridge behind the tug and Bronx Whitestone in the lower third of the shot. Both bridges were designed by the great Othmar Amman. This is the view from the NYC Ferry’s Soundview landing, in the Bronx, btw. A few years ago, I was seemingly obsessed with photographing tugs. Whereas I’m still drawn to the subject, and remain utterly fascinated by all things maritime industrial, there’s really only so many ways to shoot and frame a tug shot. Additionally, a few of my friends with whom I shared this fascination for towing vessels have passed away in recent years, and it feels sort of weird and not as much fun to be the “last man standing.” Used to be that shots like these would get sent around in late night emails to my little cadre of fellow enthusiasts, who would in turn send what they got that particular day to me. Such is life, and death, in the big city – I suppose. A humble narrator is having a furiously busy week roll through the calendar as you’re reading this. 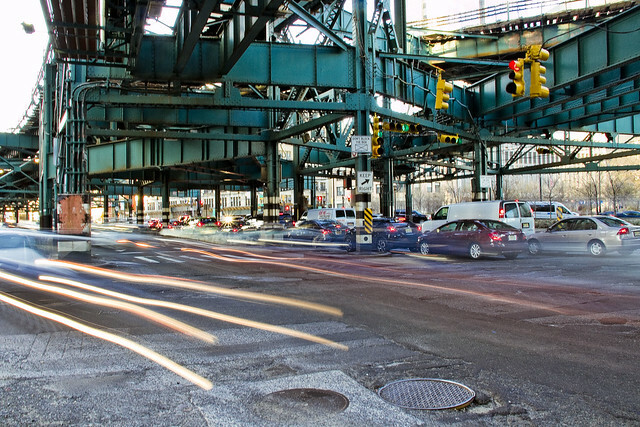 Yesterday, I got to interact with some highly placed people at NYC DOT regarding the new pathways which will be introduced into Maspeth and Sunnyside by the soon to be finished Kosciuszcko Bridge bike and pedestrian path. One offered them the experiential thing, taking them for a walk around the place. Officialdom knows far more about the streets of NY than any regular person can, but generally they know these things from paper maps, politics, and spreadsheets. “Being there” in the flesh, seeing trucks parked on the broken sidewalks and crossing hazardous intersections, is a whole different thing. Last night, a friend of mine – Pat Dorfman – received the “Sunnysider of the Year” award from the Sunnyside Chamber of Commerce, so I had to show up and take a pic or two of the awards ceremony. My dogs were barking by the time I got home and settled in on the couch. As you’re reading this, I’m probably at a polyandrion in Blissville, walking an ornithological enthusiast around. Then, I’ve got a call in meeting at 4… it never ends. Tomorrow, I’ll tell you about two events I’m doing with Newtown Creek Alliance at the end of the month – but hold the dates of April 23 and 28th for now. Flushing Bay, in today’s post. Last week I attended a meeting thrown by the NYC Parks Dept. detailing their $35 million dollar upgrades to the World Fair Marina in Flushing Bay. The plans involved relocating and rebuilding one of the docks, installing a new facility house and refueling dock, and installing a bunch of new street furniture on the public sections of the marina (benches, lamp posts etc.) It was my kind of meeting, truth be told, where the government people deliver their information in a punchy and well organized fashion, and public commentary is offered in a businesslike and terse fashion. My main interest in attending revolves around a long term bit of advocacy for Newtown Creek’s Queens shoreline which I’ve been working on, namely the creation of a similar marina on the Newtown Creek coastline Long Island City, and I wanted to take a look at “how it’s done” in the modern era. Afterwards, a bit of time was spent outside with the camera and tripod, shooting into foggy darkness. Just like the Dutch Kills tributary of Newtown Creek, the NYC DEP has been experimenting with the installation and planting of greenery, specifically Saw Grasses, in the littoral zones at Flushing Bay. 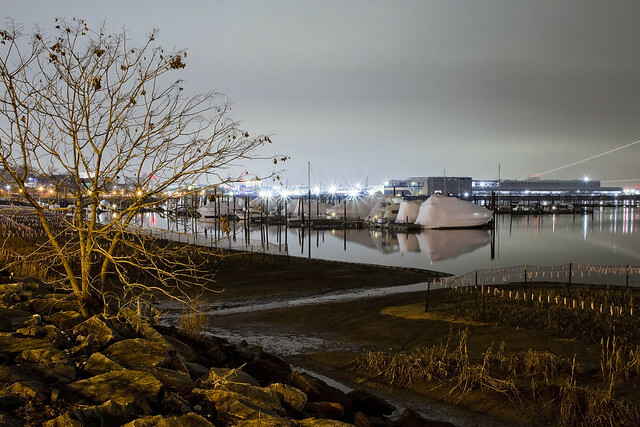 Littoral means the intertidal area of the shoreline, and they’re engaged in the project for the same reasons that they are at Newtown Creek – mitigating the long term environmental consequences of an abundance of their Combined Sewer Outfalls on the waterway. DEP, or the New York City Department of Environmental Protection if you must, inherited a messy combination of underground pipes from precursor agencies when their organization was created during a 1983 City charter revision, many of which were installed in a hodge podge manner and prior to the Federal Clean Water act. 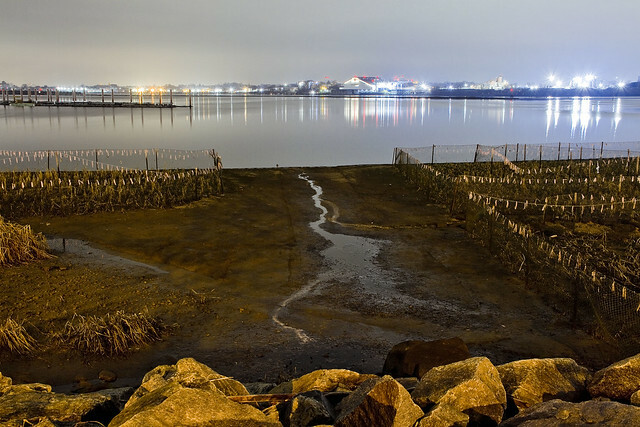 Due to the outfalls, a lot of raw sewage has historically found its way into area waterways, and the section of Flushing Bay nearby LaGuardia Airport and the World Fair Marina is notoriously and reliably smelly. The creation of these engineered wetlands is an attempt to harness the curative powers and mechanisms of nature in pursuance of fixing a manmade problem. This is the section of the north shore of Queens which isn’t forbidden, as a note. There’s a NYC Parks property which sits between the water and the Grand Central Parkway called the Flushing Bay Promenade. 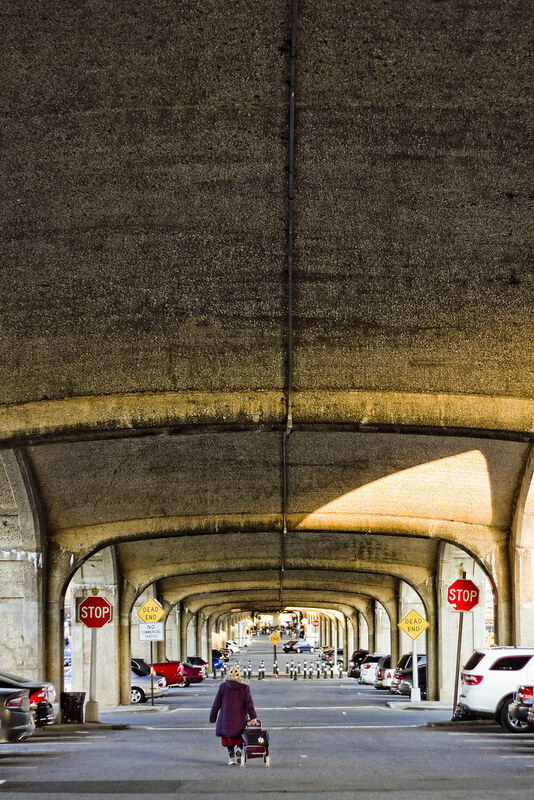 It’s 1.4 miles long, starts at the equivalent of 27th avenue, and is a modern addition to the Flushing Meadows Corona Park facility whose creation was funded by the NYC DEP in return for Parks allowing them to build a sewer retention tank in the main park. When it warms up a bit, I plan on bringing the camera back out here to the promenade and do some exploring. One suspects that this will be a seldom read post, given that the vast majority of New Yorkers will be going somewhere else today. I plan on staying in Astoria, just to defend the neighborhood against burglars and sneak thiefs. 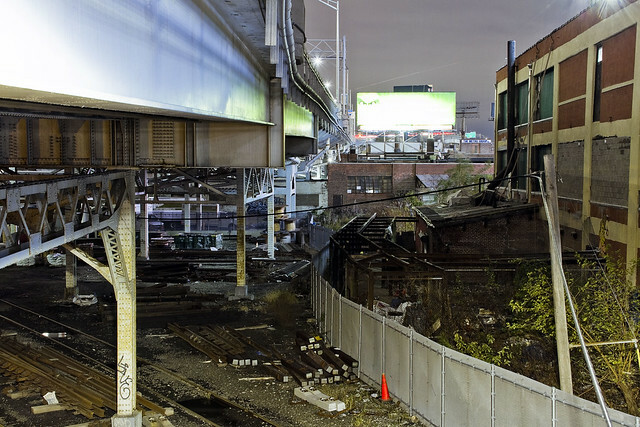 I also plan on walking out into the concrete devastations of Newtown Creek a few times, in pursuance of more nocturnal shots like the ones in today’s post. The City has been replacing its street light heads with cold colored LED luminaires in recent years, which are meant to provide brighter and more directed light onto roadways. The State is still using the old school sodium lights which produce a warm yellow-orange light. 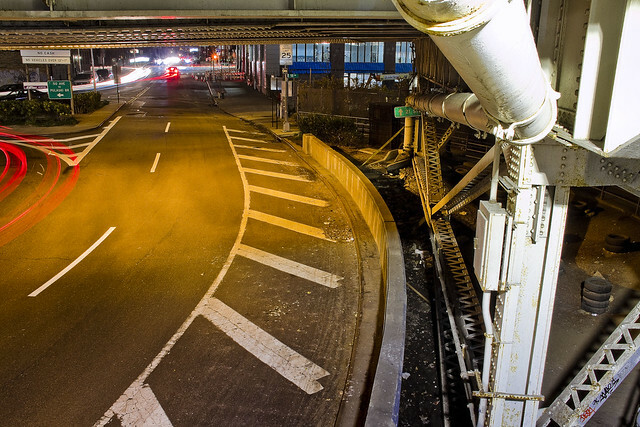 A humble narrator is often fascinated by the spots where these two different colors of artificial light mix, as in the case of the shots above which is in DULIE – Down Under the Long Island Expressway – here in LIC. As it happened, when I surmounted the Pulaski Bridge in pursuance of gathering a shot from the span (a photo which was unfortunately blurry due to the transmitted vibrations of passing traffic), workers from the NYC DOT Bridges unit shooed me back along the walkway so that they could safely open the draw bridge for a passing tugboat. Wasn’t that nice of them? Everything in Queens has a cool story attached to it, if you care to look. My reason for coming over to the forbidden northern coastline of Queens on this particular day was to gather a few street side shots of the NYC DEP’s Bowery Bay Wastewater Treatment Plant. I know… who dares to spend a Saturday evening walking over to the local sewer plant? One such myself, that’s who dares! 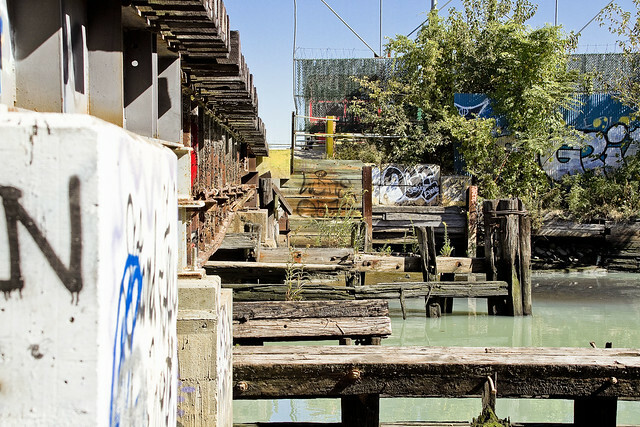 Bowery Bay is the fifth largest of NYC’s 14 sewer plants, and you’ll find it on Berrian Blvd. between Steinway and 45th streets in Astoria, on the forbidden northern coast of the borough of Queens. 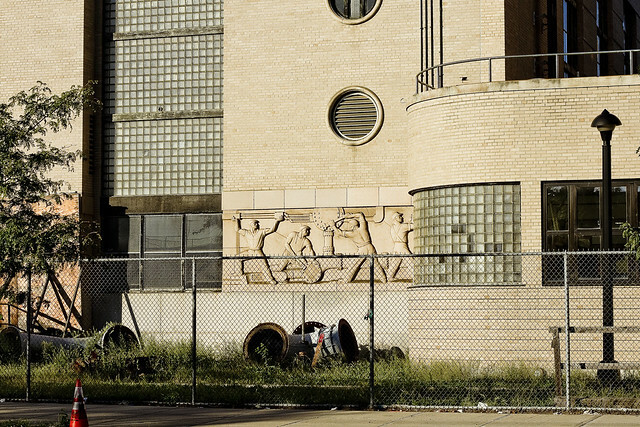 Check out that bas relief on the Art Deco building with curved walls and glass brick windows! More on that in a minute, after the sewer story. 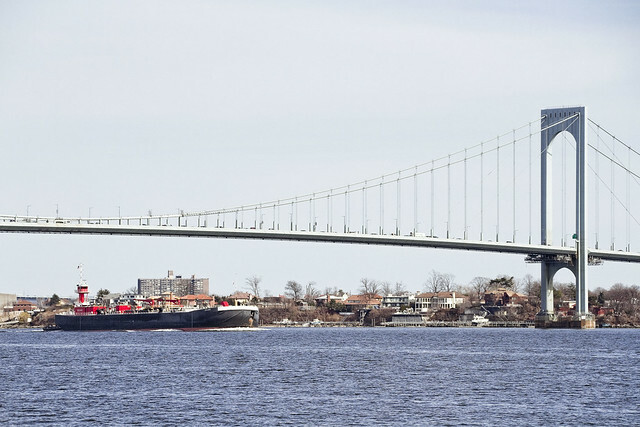 Long story short, by the beginning of the 20th century, NY Harbor was in essence an open sewer which was severely compromised by both industrial and biological waste. Remember, before cars there horses and oxen, and everybody and everything poops at least once a day. They used to just wash into all the sewers, which were open to the rivers and harbor. This is why the rich people lived on the central spine of Manhattan, rather than at the water’s edge where the poor people gathered in tenements. In 1909, a fellow named Dr. George Soper (who was also the guy who identified Typhoid Mary) led the first comprehensive survey of the harbor’s ecology. In 1914, Soper led the Metropolitan Sewerage Commission, which released an 800 page long “Main Drainage and Sewage Disposal Works Proposed for New York City: Reports of Experts and Data Related to the Harbor” document which made recommendations about curatives. By 1920, a plan had been drawn up, and in 1929 the Department of Sanitation was designated as the agency which would execute it – digging sewer pipes, connecting existing drainage systems in what was now the five boroughs, and building water treatment or sewer plants. They would also do what DSNY continues to do today, but what’s now the DEP used to be part of Sanitation. Then the Great Depression came along. President Roosevelt created the Work Projects Administration (WPA) to jump start the national economy and put the talents of the jobless masses to work on vital infrastructure projects around the country. Hoover Dam, as well a good number of schools, libraries, parks, and post offices got built by WPA in this fashion. WPA didn’t forget about art, and made it a point of including public artworks on many of its projects. The WPA people worked with DSNY to build three new wastewater treatment plants in NY Harbor (between 1937 and 1944) – Wards Island in Manhattan, Tallman Island, and Bowery Bay in Queens. 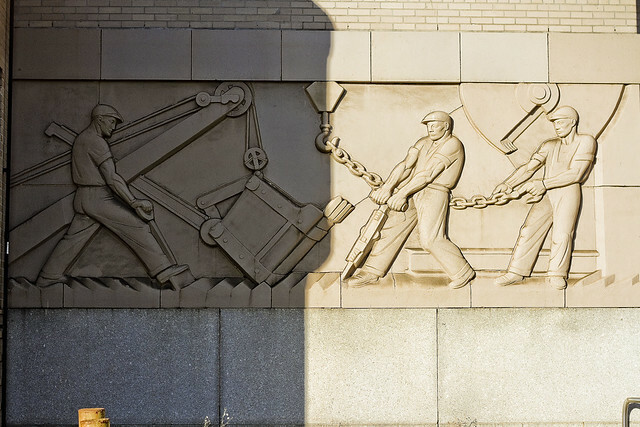 The bas reliefs adorning the Bowery Bay plant are by an Italian American sculptor named Cesare Stea. The Bowery Bay plant sits quite low to the water, and is in fact within the current zone you’d expect to flood due to coastal storms. Hurricanes Irene and Sandy did quite a number to the place, I’m told, and if current projections about sea level rise are accurate, the DEP is going to be experiencing a lot of problems at Bowery Bay in the coming decades. 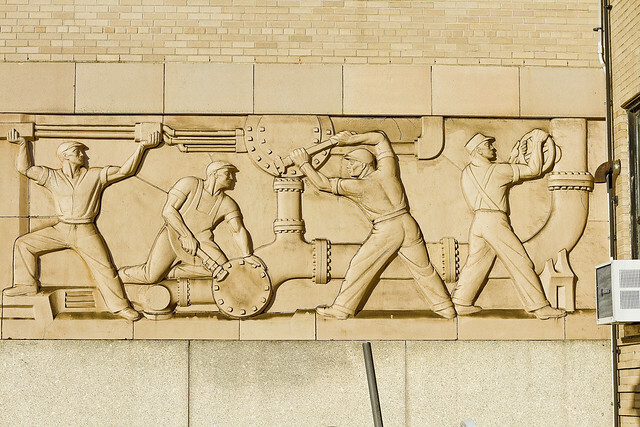 Two of Stea’s Bas Reliefs depicting depression era wastewater workers are covered (there’s four), along with an Art Deco entranceway to the plant, by plywood. Presumptively, the structure is still being repaired from the walloping it took during Hurricane Sandy. 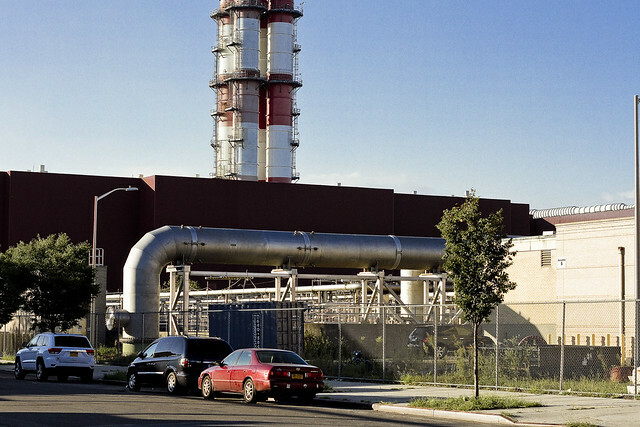 Having hung around the more modern plant in Greenpoint has familiarized one with the shape of things, and the shot above depicts the settling tanks and high pressure air pipes which aerate the “honey” at the treatment plant. The stuff spends a bit of time in deep concrete tanks with pressurized air being forced into it from below. This causes solids to migrate downwards in the liquid column for post drainage collection, and oils and greases to migrate upwards for skimming. 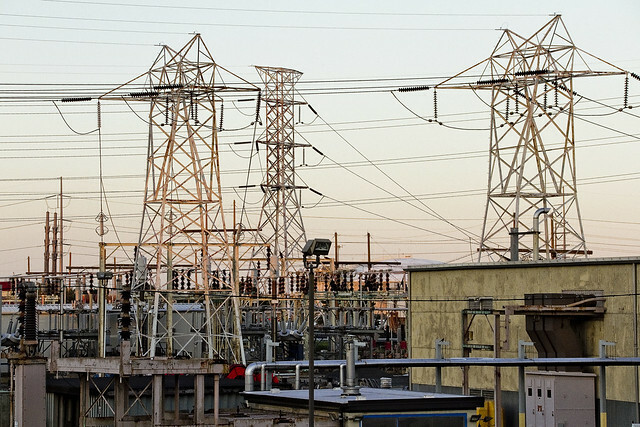 By modern day standards, there’s a lot left to be desired by the Bowery Bay Plant. It was designed with neighborhoods of two story homes and factories in mind, not city block sized fifty story residential towers. It just isn’t the way people think anymore, I’m afraid. What we’re doing, municipal plan wise, is akin to cooking a large holiday meal, not setting up the table with plates and silver wear, and just flopping the food onto the table. You then tell your family and guests to just lick it all up, and that probably next year you’ll go out and buy plates. Or at least, we will leave that to the next Mayor to deal with. Dr. George Soper would probably be angry, if he hadn’t died in 1948. Back and forth, back and forth, it never ends. Meeting season seems to be upon us all, wherein the various affiliations, causes, and organizations which I’m involved with want to get together in a room somewhere and discuss policy, plans, and or problems related to the issues of the day. 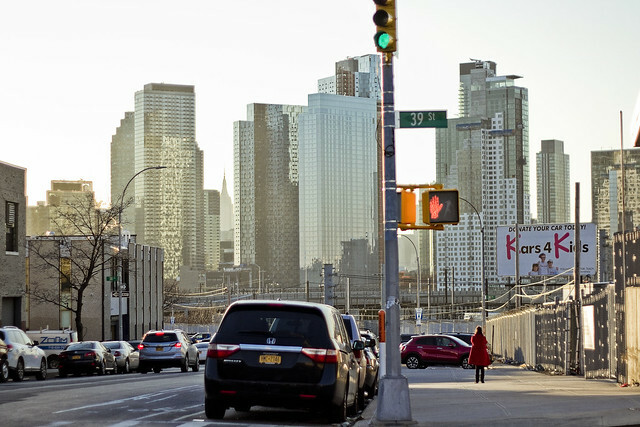 Somehow this almost always involves me having to scuttle to Long Island City or Greenpoint at an inconvenient time, but it does allow for intervals on the journey to do a little shooting. 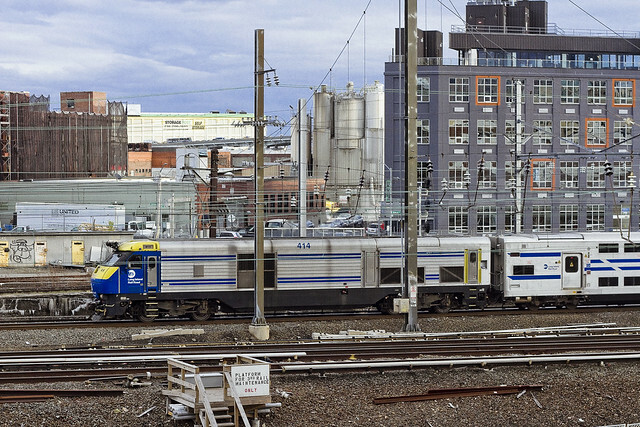 Pictured above, a Long Island Railroad Mainline train set on its way from the City to points east, and crossing through the Sunnyside Yards. Intrigued as I’ve been with long exposure shooting for the last several months, an endeavor which is usually carried out at night, whenever I’ve got a spot I can do a long exposure during daylight hours, I take it. That’s about two seconds of accumulated time from Queens Plaza in the shot above. I found a nicely positioned steel bracket which braces the construction scaffolding at one of the tower apartment construction sites on which to brace the camera, lock in the focus, and hold down the shutter button while watching the Fords roll by. 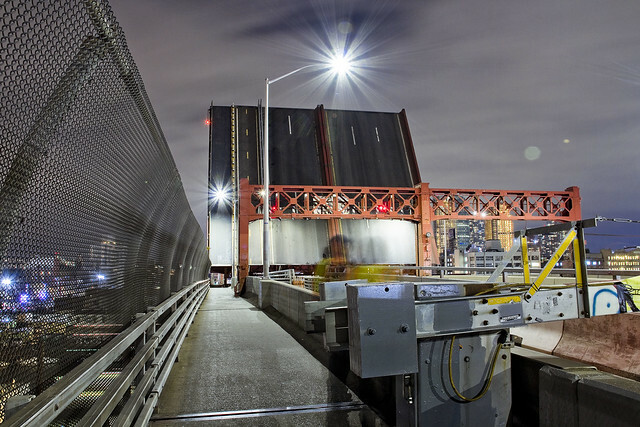 An even longer exposure from the other night on Kingsland Avenue in Greenpoint, alongside the Unnamed Canal sub tributary of the fabulous Newtown Creek. 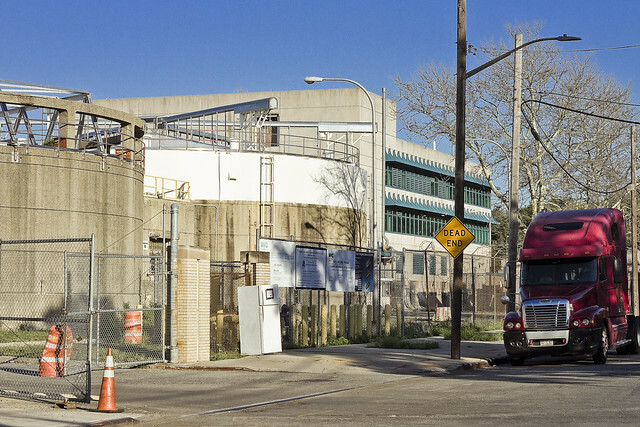 It depicts a somewhat abandoned Department of Sanitation Marine Transfer Station which sits on the shoreline street end of North Henry Street (whose north/south path is interrupted by the sewer plant). The fences were locked up about a year or so ago, and you used to be able to go in there and explore. I think they’re using it to warehouse “stuff” now, but can’t really say for sure. At the very least, they’ve fixed the lights inside the thing. April 29 – Bushwick-Ridgewood borderline Walking Tour – with Newtown Historical Society. Join Kevin Walsh and Mitch Waxman as they take us along the border of Brooklyn and Queens, Bushwick and Ridgewood, with stops at English Kills, an historic colonial Dutch home, and all kinds of fun and quirky locations. End with an optional dinner on Myrtle Avenue before heading back to the Myrtle-Wyckoff subway station. Tix are only $5 so reserve your space today! Opposites can repulse or attract, no matter what Paula Abdul said. Laboriously explained over the last few weeks of night shooting, the tripod technique one has been exploiting involves using small apertures, low ISO camera sensitivity, and long exposures to gather images. It’s rather the opposite of my normal shooting procedure. Out for a scuttle one recent afternoon, a humble narrator decided that since it was incredibly bright out he’d do the opposite of that normal procedure for daylight shots – wide open aperture photos with a shallow depth of field. 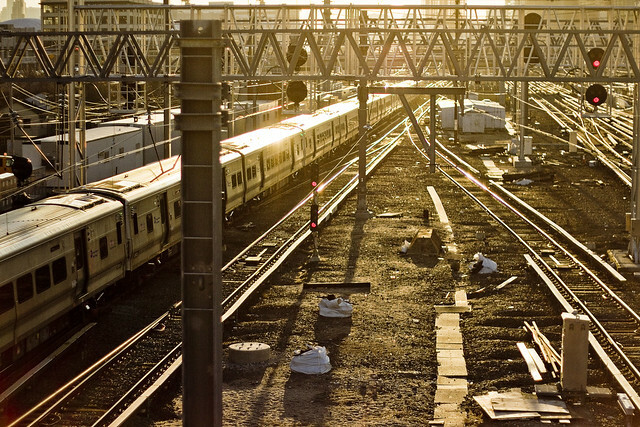 That’s the Harold Interlocking pictured above, at the Sunnyside Yards. 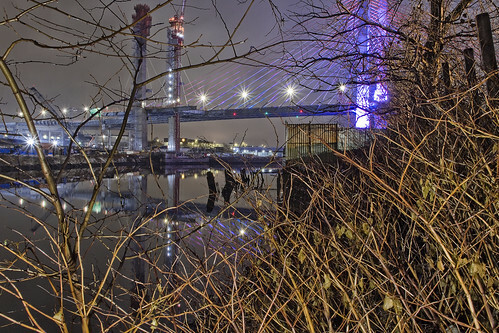 A night shot from the same vantage point was offered in last Friday’s post. Given that I was pointing the camera into a scene full of reflective surfaces which the sun was setting behind, and the aperture was set to f1.8, I had to reduce sensor sensitivity down to ISO 100 and use a shutter speed of 1/8000th of a second to control the light. 1/8000th is as fast as my shutter will flip, I would mention. That’s fast enough to freeze a bee’s wings mid flap, or to render an in flight helicopter blade static. It’s kind of thing with me… when it’s not a shot “I have to get,” I like to experiment and see what the capabilities of the capture device are at their extremes. I wandered around a bit with this particular set of settings, which is something else I force myself to do periodically. There are days where I leave my camera bag and zoom lenses at home and go out for a stroll with just a 50mm lens attached and the camera settings locked. The “nifty fifty” as its called, offers an aperture range between f1.8 to f22, with its only real limitation being that it’s a prime lens and fixed to its singular focal range. That means I need to either get close or go further away from a subject. There’s a reason for this, which is to keep on my toes. Limiting yourself can sometimes force you to get a bit more creative, or just deep dive into the inner workings of the camera. The shot above won’t be finding its way into National Geographic, for instance, but it was a fine balancing act challenge – exposure wise. Be back tomorrow with something completely different at this – your Newtown Pentacle. It’s National Boston Creme Pie Day, in these United States. If you want to know what the end of the world looks like, I can take you there. 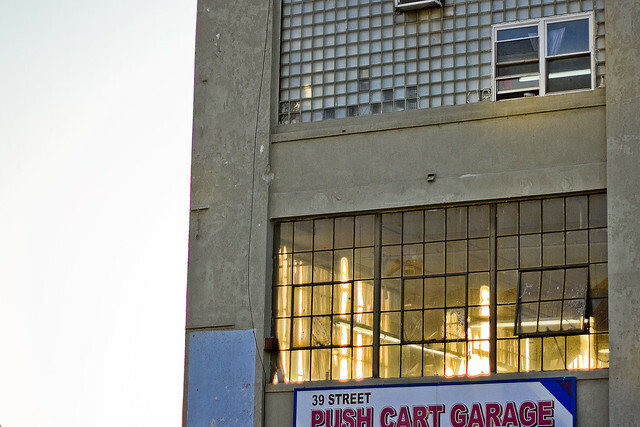 It’s about 3.8 miles from the East River, in an area of Brooklyn that is clearly Bushwick but which the real estate people refer to as East Williamburg. The end of the world is surrounded by heavy industry and waste transfer stations, and is crossed by a railroad bridge. 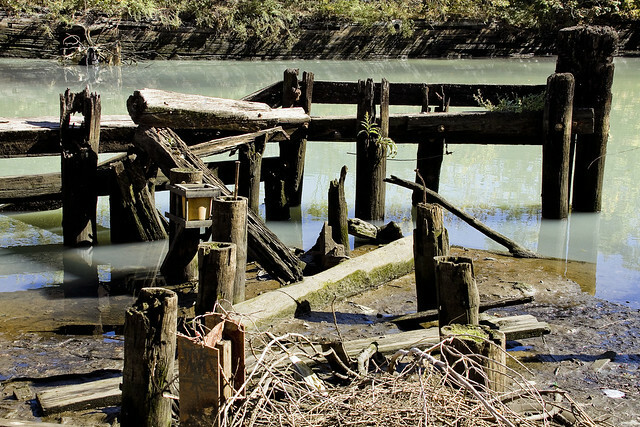 It’s defined by a waterbody called English Kills, which is a dead end tributary of the fabulous Newtown Creek. Just last week, a visit was paid to this paradise of nihilism. The open sewers are just one of the apocalyptic factors back here, as is the enormous waste transfer station operated by a transnational conglomerate that handles about a third of the black bag (or putrescent) garbage collected by the Department of Sanitation. There is virtually zero laminar flow to the water here, which means that the rising and falling of the tide is a vertical affair rather than a horizontal one, creating stinking shoals along the banks and allowing sediment mounds to rise from the channel. It often smells like rubber cement thinner along this stretch of English Kills, the waters are greasy, and they commonly exhibit an uncommon and unnatural coloration highlighted by patches of weird iridescence. 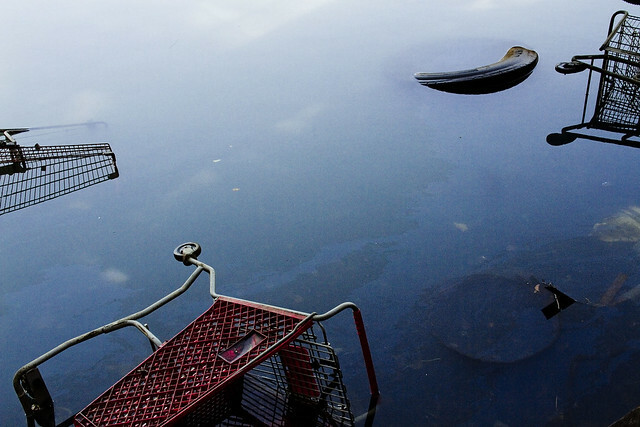 Men and women seem to become possessed by the spirit of the place, wildly dumping garbage into the shallows with a gleeful abandon. References in the historical record refer to distinct periods in English Kills’ existential course. Once, a mostly fresh water stream fed by the springs and streams of a Bushwick that drew German beer Brewers to the area, which bled sweet water into the main body of Newtown Creek, just a decade after the American Civil War English Kills began to be described as the “industrial canals of Brooklyn.” By the time that the Army Corps of Engineers oversaw the WW1 era shaping of the Newtown Creek watershed into something we would recognize on a google map in modernity, English Kills had open pipes carrying industrial and chemical waste products into the water from acid factories and the other dirty industries surrounding it. The upland springs and steams which drew the brewers here were paved over or turned into sewers, and the only naturally occurring liquid entering the narrow channel afterwards was a tepid trickle of brackish East River water (which was itself terribly compromised) weakly pulsing in with the daily tide, or storm runoff from the streets. Brooklyn legend suggests this area was used as a graveyard by mobsters, but that’s just a legend. 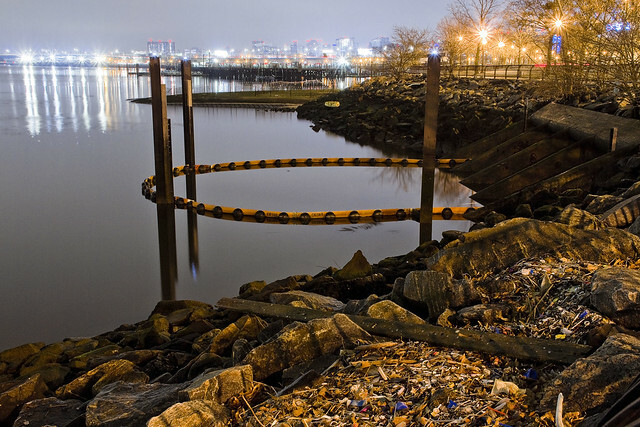 Gangsters dump bodies into fast moving or oceanic water bodies like Jamaica Bay or the Hudson River. The idea is to get rid of the evidence, not to leave something incriminating in a place where it can be found. Whatever enters English Kills stays in English Kills. The structure pictured above is the Montrose Avenue Railroad Bridge, part of the Bushwick Branch lead tracks of the Long Island Ralroad. The bridge, and adjacent fencelines, are covered in odd graffiti which is in English but drawn with characters that betray a runic influence. The screeds warn of witches and other mythological creatures. 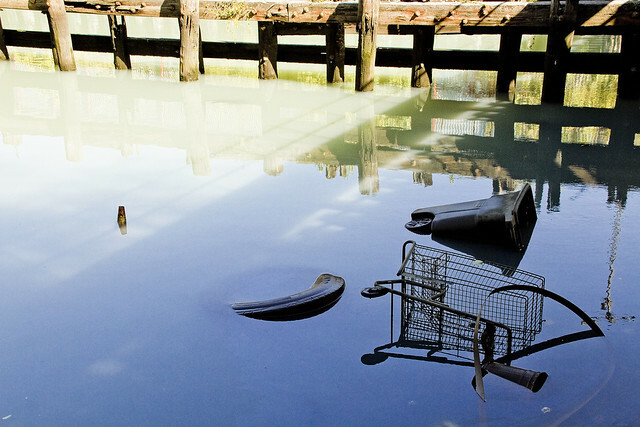 This is what the end of the world looks like, if… like me… the borders of your world are defined and bisected by that lugubrious ribbon of urban neglect known as the Newtown Creek. 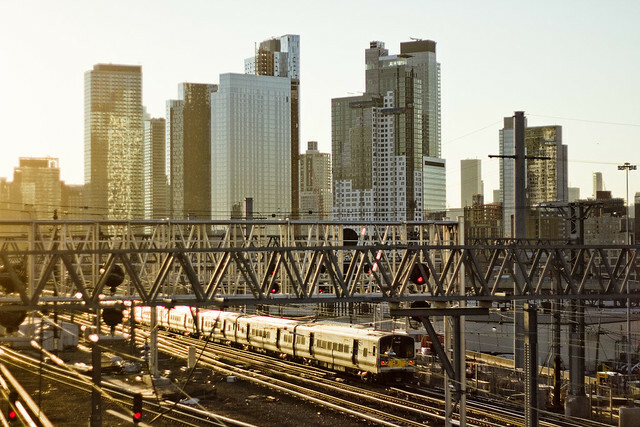 with NY Adventure Club – Sunday, November 12th, 2:30 p.m. – 4:30 p.m.
Long Island City is a tale of two cities; one filled with glittering water-front skyscrapers and manicured parks, and the other, a highly active ground transportation & distribution zone vital to the New York economy — which will prevail? 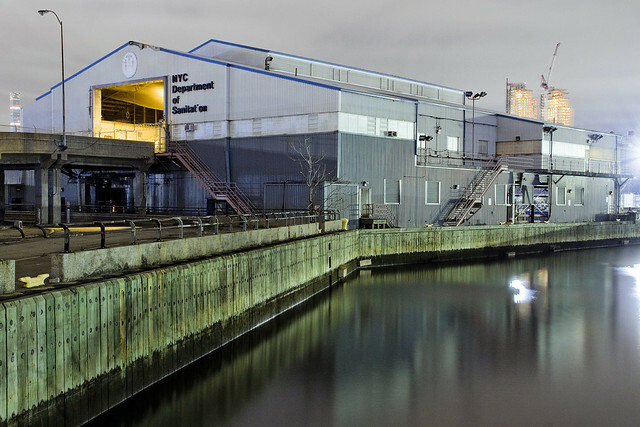 With Newtown Creek Alliance Historian Mitch Waxman – details here.